The price for Haier 6 kg Fully Automatic Top Load Washing Machine ( HWM 60-10 ) is valid across Bangalore, Hyderabad, Chennai, Mumbai, Delhi, Pune and Kolkata. The Haier 6 kg Fully Automatic Top Load Washing Machine ( HWM 60-10 ) is available at best price of INR 0 on Flipkart. Worth every penny!! :) Totally satisfied.. 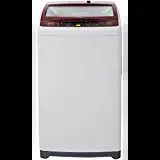 I ordered this washing machine for Rs.9081 (Exchange + Axis bank card offer) and got delivered within 24 hours. Below is my review. Pros: 1. Compact. Does not take much space. 2. Very less noise even though during spin 3. Easy to operate. 4. Stainless steel drum is an added advantage for the price. 5. Good packaging and quick delivery by Flipkart. Prompt installation on next day of delivery itself. Cons. 1. Drum looks little smaller than other 6kg machines though it does the work perfectly. 2. Quick wash runs only on Low water level only. This could have made to operate at all water levels. its superb. i got this 9800, amezing for this prise. 0 noice, and 90% dry after wash. built quality is also very good. and its look attractive. service of flipkart is awsom. before time delivery, and installation and damo is also on time. thnx to flipcart.